What is ComponentOne Studio for Xamarin? In order to ensure you get the fastest, most flexible controls available, GrapeCity’s native mobile development team has directed its focus to developing the best Xamarin controls on the market. This new architecture adds UWP support, provides support for Xamarin’s visual designers, and brings up to twice the performance of the previous version of Xuni. The 2017v2 release will bring the full complement of controls to the new architecture with updated versions of Calendar, CollectionView, Input, Gauge, FlexChart, FlexGrid, and FlexPie. 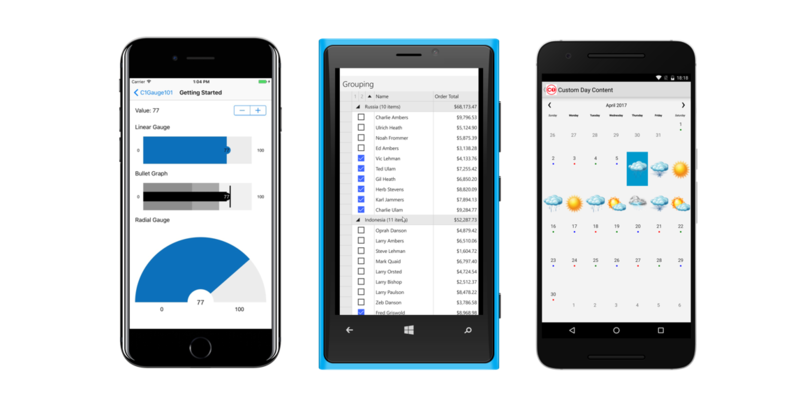 The newly restructured controls still have all the speed, flexibility, and easy-to-read API of the existing charts, grids, and gauges, but they've been rebuilt to focus specifically on Xamarin. These restructured controls include some new features as well, like the addition of pull-to-refresh and zooming to FlexGrid. Included in ComponentOne Studio for Xamarin are controls for Xamarin.Forms, Xamarin.iOS, and Xamarin.Android. Customers can buy Xamarin.iOS and Xamarin.Android as separate editions, but we recommend the full complement of products to achieve the best native mobile reach. What happens to my Xuni license? The Xuni product line--which includes Xuni Enterprise, Xuni Xamarin, Xuni iOS, and Xuni Android, will be sunsetted with the launch of ComponentOne Studio for Xamarin on July 19, 2017. Current license holders will be granted licenses to the new product that corresponds with their current license: Xuni Enterprise and Xuni Xamarin will get ComponentOne Studio for Xamarin Xuni Android will get Xamarin.Android Edition Xuni iOS will get Xamarin.iOS Edition You will not need to take any action for your license to transfer. You Xuni keys will automatically roll over into the new products. You'll be able to use create app keys in the same manner as Xuni through the licensing portal for ComponentOne Xamarin Edition. What about my Xuni app? Since Xuni is being sunsetted we will not be providing updates to that product in the future. However, since Xuni and ComponentOne Xamarin Edition share many features in common we will provide fixes for bugs that are shared between the two platforms in the new architecture as incentive to migrate. You will still be able to use our portal to generate Xuni app keys if needed (which should be common between the new architectures) though Xuni will see no further updates. This also means that we will no longer be providing updates for our native Xuni iOS and Android controls, though those users with current licenses will be able to migrate to the ComponentOne Xamarin.iOS and Xamarin.Android Editions respectively. If you have any questions, don’t hesitate to contact us or ask questions in our forums. Try the ComponentOne Studio for Xamarin beta!